Based around the world renowned SPD technology we have engineered the most adaptable caged-clip system on the market. The DMR V-Twin mtb clipless pedal offers a huge number of different grip and feel options. Using our range of pins paired with a unique Nylon “bumper” and Metal Shim feature, the pedal can be customised to optimise your float and preferences and improve your ride experience. "If you're a serious downhill or enduro rider and want the support and feel of a flat pedal with the benefits of a clipless setup, it's one of the best". 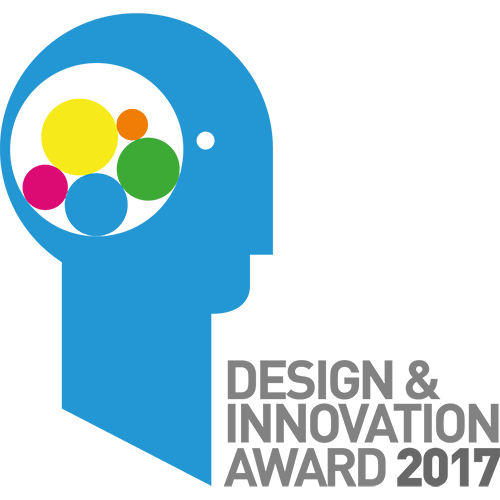 They're supportive, tuneable, work really well and there's an endless rainbow of colours for you to choose from too. The DMR V-Twin is a smart looking clipless pedal, with some excellent features and a robust build quality. We love the adjustable cage system, as this offers a true custom feel for your shoes – and we love that DMR hasn’t messed about with a clip-in system that has worked brilliantly from day one. 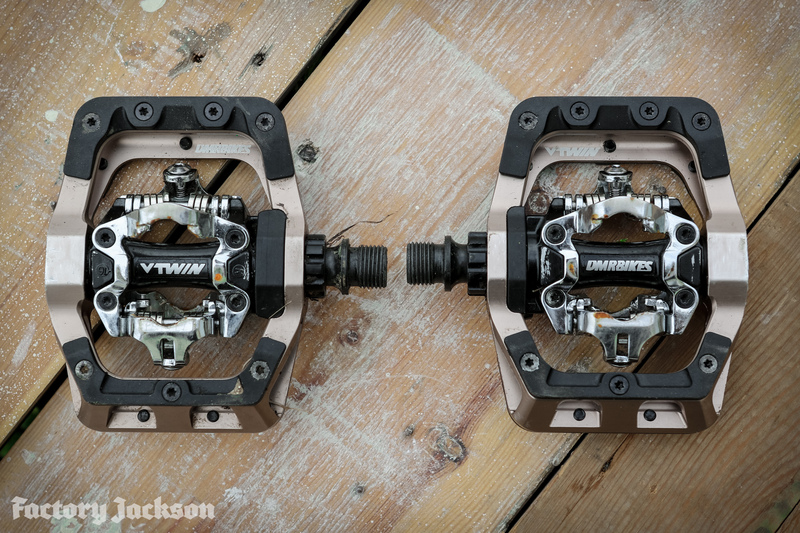 DMR has joined the clipless pedal market where the excellent, but somewhat dated Shimano DX pedal has left off – and they’ve made a damned good job of it. "Pedals are crucial contact points between bike and rider, but there’s been little revolution in this field for many years. 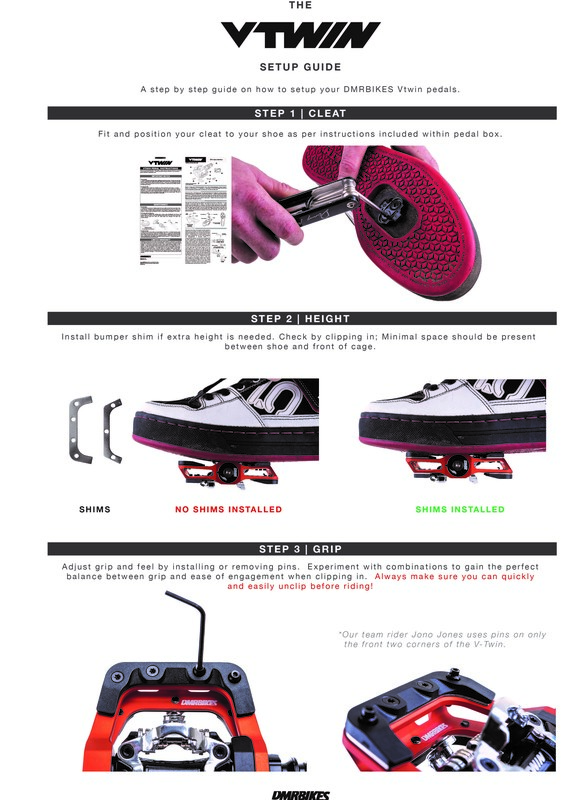 not only can you change the number, position and length of the (optional) pins, you can also switch the thickness of the plastic plates on the pedal body. Currently, each pedal comes with pre-selected plates, but in the future you’ll be able to customize the layout, thickness and colour scheme of your V-Twin pedals then, via a download link, use a 3D printer to make them yourself. In the standard set-up, the pedals felt secure, functioned well when clipping in and out and the ample proportions proved a the perfect platform."